General William “Billy” Mitchell (1879-1936) was both a celebrated and polarizing figure during his career as a US Army officer. 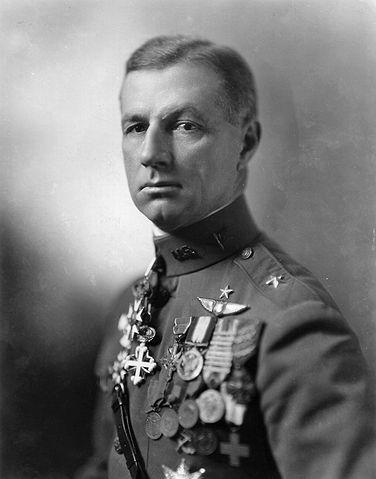 After World War I he championed military aviation. His fierce advocacy brought him into conflict with other military leaders, ultimately leading to his court martial. He has been posthumously praised for his vision and widely hailed as one of the forefathers of the US Air Force. The son of US Senator JOHN MITCHELL and grandson of ALEXANDER MITCHELL, “Billy” grew up on the family’s estate in what is today WEST ALLIS. He attended Racine College of Wisconsin (an Episcopalian preparatory school) for six years before entering Columbian University (now George Washington University) in 1895. Three years later he joined the US Army, which he served in for 27 years. 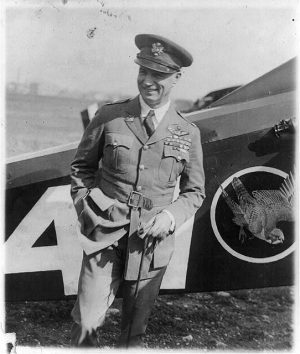 Mitchell commanded air forces in France during World War I. He famously led nearly 1,500 aircraft in the Battle of St. Mihiel. He earned several awards for his service during the war, including the Distinguished Service Cross. After the war Mitchell argued that aviation should play a larger role in American military strategy. He publicly denounced officers who disagreed, accusing them of “incompetence, criminal negligence,” and “almost treasonable administration of our national defense.” In 1925 he was convicted in a court martial on a charge of working “to bring discredit upon the military service.” After being found guilty, Mitchell resigned his commission. Following his death in 1936, Mitchell was buried in Milwaukee’s Forest Home Cemetery. In 1941 the Milwaukee County airport was renamed General Mitchell Field (later the General Mitchell International Airport) in his honor. ^ James J. Cooke, Billy Mitchell (Boulder: Lynne Rienner Publishers, Inc., 2002), 1-6; Alfred F. Hurley, Billy Mitchell: Crusader for Air Power (Bloomington: Indiana University Press, 1975), vii-2; Joseph Lloyd Croteau, “Billy Mitchell: Author of an Air Power Geo-Political Theory?,” (Master’s thesis, Chapman College, 1980), iv-v.
^ Cooke, Billy Mitchell, 8-9, 13; John Gurda, Cream City Chronicles: Stories of Milwaukee’s Past (Madison: Wisconsin Historical Society Press, 2007), 215. ^ Gurda, Cream City Chronicles, 215. ^ Cooke, Billy Mitchell, 14; Croteau, “Billy Mitchell,” 12; Alfred F. Hurley, Billy Mitchell: Crusader for Air Power, 2-3; Isaac Don Levine, Mitchell: Pioneer of Air Power (New York: Duell, Sloan and Pearce, 1943), 17. ^ Croteau, “Billy Mitchell,” 12. ^ Croteau, “Billy Mitchell,” 16. ^ Cooke, Billy Mitchell, 101. ^ Croteau, “Billy Mitchell,” 30. ^ Croteau, “Billy Mitchell,” 31-32. ^ Cooke, Billy Mitchell, 275. ^ “Mitchell Honored in Death: County Airport Named for General,” Milwaukee Sentinel, March 18, 1941; “History: Milwaukee Aviation History—General Mitchell International Airport,” General Mitchell International Airport, accessed May 23, 2014. Cooke, James J. Billy Mitchell. Boulder: Lynne Rienner Publishers, Inc., 2002. Gurda, John. Cream City Chronicles: Stories of Milwaukee’s Past. Madison: Wisconsin Historical Society Press, 2007. Hurley, Alfred F. Billy Mitchell: Crusader for Air Power. Bloomington: Indiana University Press, 1975. Levine, Isaac Don. Mitchell: Pioneer of Air Power. New York: Duell, Sloan and Pearce, 1943.